The 35th Infantry Regiment Association salutes our fallen brother, PFC Henry Lue Weaver, who died in the service of his country on April 22nd, 1967 in Quang Ngai Province, Vietnam. The cause of death was listed as Small Arms/AW. At the time of his death Henry was 20 years of age. He was from Home, Pennsylvania. Henry is honored on the Vietnam Veterans Memorial at Panel 18E, Line 73. The decorations earned by PFC Henry Lue Weaver include: the Combat Infantryman Badge, the Bronze Star with V, the Purple Heart, the National Defense Service Medal, the Vietnam Service Medal, the Vietnam Campaign Medal and the Vietnam Cross of Gallantry with Palm Unit Citation. 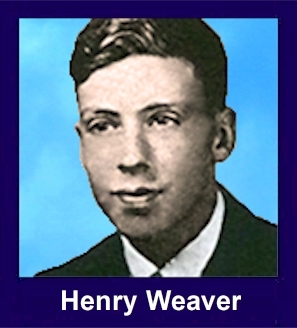 PFC Henry L. Weaver, 21, of Plumville was fatally wounded Wednesday, April 22, 1967 by hostile enemy gunfire in the Republic of Vietnam. Born Dec. 31, 1946 at Plumville, he was the son of Irwin and Viola Shaffer Weaver. Pfc. Weaver was a graduate of Marion Center High School and was inducted into the U.S. Army Aug 10, 1966. He received his Basic Training at Fort Jackson, S.C. and departed for Vietnam Feb 9, 1967. Prior to his induction, he was employed by Ernest C. Dean Contracting Co. in New Bethlehem. Survivors include his parents, mentioned above; two sisters and a brother: Gladys, Janet, and Raymond, all at home. Friends will be received at the Bowser Funeral Home in Plumville, from 7-9 p.m. today and from 2-4 and 7-9 p.m. Tuesday. Funeral services will be conducted at 2 p.m. Wednesday at the funeral home, Rev. J.B. Troutman and Rev. Carl P. Milano, officiating. Interment will be in the Lutheran Cemetery, Smicksburg. Members of VFW Post 8555, Sagamore, and a Regular Army unit stationed in the Pittsburgh area will conduct military services at the grave.